Yup!! We have all tried mac & cheese. Undoubtedly a delight for any kid, I have known many adults to succumb to this wholesome and hearty dish. But hey, macaroni is not just for kids. And melted cheese is key to the comfort food that I believe is best set aside for a cold winter day!! Pasta and innovation just go hand in hand. So here's another original for you from my kitchen. The story behind this is that this year I have created for myself a lovely kitchen garden!! I decided to do this a bit late in the season, so I am enjoying the lovely vegetables a bit later that they would normally have appeared. At present, I have beautiful yellow, almost golden plum tomatoes, yellow wax beans, basil, and cilantro. I have eaten yellow wax beans in the past, in restaurants, and friend's homes but never cooked them. Now normally, these beans are blanched and served in a salad. But I knew that I just did not have the ingredients to complement them in a salad. So after picking a great big bunch of them I decided to use them in a pasta. I also used my very own home-grown basil for this dish - the taste was simple spectacular. Boil the macaroni in plenty of water and salt. Drain and set aside. Pour the oil in a non-stick wok. When it is warm, add the garlic, and fry for 1 minute. Next add the basil and onion, and fry until the onion is transparent. Add the yellow beans and cover and cook for 6 minutes. Now add the black beans and walnuts. Stir and cook for another 2 minutes. Add the macaroni to this mix with the seasonings. Stir to blend well. Serve hot or enjoy cold as a salad to accompany your main course. The Bean & Walnut Pasta is my very first entry to Grow Your Own hosted by Andrea at Andrea's Recipes. Interestingly, it is also the one year anniversary of this food event! Make sure to drop in and wish Andrea. One food event I really enjoy participating in and contributing to is Presto Pasta Nights! 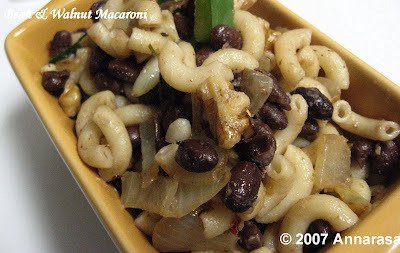 The dish also goes out to Ruth of Once Upon a Feast who is hosting Presto Pasta Nights #78 this week. Find this recipe @ The Back Burner - The Key Ingredient Blog. Anything cooked from your own garden always tastes good :) Pasta looks gr8! wow,..nice combo,.how wasur weekend,..ceeya soon,..
What a healthy macaroni version.. But this looks like another interesting possibilty ! Congrats for owning a kitchen garden.Yum love pasta and i think basil leaves will add a new taste as well as more healthy for our health. I tagged u. Check my blog. I wish I had a place to grow my own anything. But fortunately the grocery shops and market here in Halifax have lovely local produce so I can try out this lovely dish of your. I just clicked over from Dhanggit's blog -I thought you should have won! Those Potato Samosa's looked melt-in-your-mouth tasty! My mouth is watering just thinking of them! Yum! Welcome to Grow Your Own! We really like the yellow wax beans, too, and plan to add them to our garden next year. Your dish looks great! What an interesting combination of ingredients. Judging from the picture, it works quite well!